Much like Pharrell Williams sings in "Happy," Donna Skeels Cygan feels that happiness is the truth for her clients. Donna Skeels Cygan and her book. Can a financial advisor — presumably hired to improve a client’s net worth — have an impact on the client’s self-worth? Does an advisor even have permission to tread in this sensitive area that many would regard as a personal and not a professional concern? 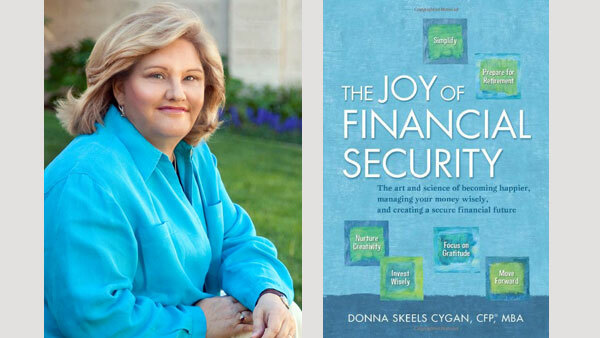 Much like Pharrell Williams sings in “Happy,” Donna Skeels Cygan feels like happiness is the truth — and thinks clients’ happiness is fair game for a financial advisor. “My role is to not only grow my clients’ assets or protect their assets, but to also help them enjoy the assets,” says the Albuquerque-based fee-only advisor in a phone interview with ThinkAdvisor. Now Cygan has published a short new e-book, “Invest in Joy: 8 Happiness Strategies,” that she hopes advisors and their clients can use to broaden the scope of their investment objectives to include living rich rather than just becoming rich. The advisor — and professional joy investor — says some strategies will resonate more than others depending on a person’s current life stage. Three strategies that Cygan is currently emphasizing are Nos. 3, 4 and 6 in her e-book. No. 3 (“Lead a Healthier Lifestyle”) is, ironically, her No. 1 priority right now. It rose to that level just this Sunday. Cygan belongs to a financial advisory study group, a common practice among advanced planners, that meets twice a year. The group was meeting in California last weekend, but because of a sinus affection, Cygan said she would participate via GoToMeeting. When she presented her set of nine professional strategic objectives — one of which was getting healthier — the other advisors in the group “ganged up on me,” Cygan recalls. Her colleagues gently told Cygan she needed to make her own health the first priority. As a veteran advisor, Cygan is accustomed to putting her professional obligations first, but the intervention worked. “I’m totally committed at this point,” she says of her exercise and nutritional plans, adding that the support of this cohesive group has the added benefit of adding to her personal happiness. Cygan says that scheduling time with friends and relatives noted for their sense of humor and travel all promote laughter. Coming up: six days in South Carolina with girlfriends who met when they all worked for the same Chicago firm 30 years ago. The women have all scattered over the decades so they pick a spot each year to “laugh and tell old stories.” The annual event entails “just a huge amount of laugher…Left to my own devices, I’d work every day of the year, which is so unhealthy,” the recovering workaholic says. Cygan is currently in the process of purging her home — after 23 years of living in it. “Clearing it all out — letting it go to charity so someone else can enjoy it — makes a huge difference to my stress level,” she says. The Cygans may even relocate to a new home — their children are grown — to make a fresh start, though the purging is not contingent on a move. The joy investor was influenced in this regard by a bestselling book called “The Life-Changing Magic of Tidying Up: The Japanese Art of Decluttering and Organizing” by Marie Kondo. To that end, Cygan is also simplifying her schedule — keeping evenings free as “down time,” for example, and reserving the right to say no to the many proposals and requests she previously would have acceded to. All these changes are making Cygan happier, but how are her clients accepting the intrusion of joy? One of her clients, a reserved and reticent 65-year-old astrophysicist, surprised her in expressing approval of an article she had distributed to her clients on happiness, commenting critically that his previous planner would never have done so. “He’s not the type I ever thought would be agreeable to an article on happiness,” she says. Based on experience, Cygan offers this counsel to advisors worried their clients would resist discussion of investing in joy as a topic too “fluffy” for financial planning. “Let’s say you…get a client who looks at you like you’ve got a screw loose. There are two ways to combat this: One is humor. Laugh it off. Say ‘Let’s just move on; I tried.’” Maybe the next meeting they’ll be okay with it; they were just caught off guard the first time. “A second way is to share stories about myself. Cygan is prepared to discuss whatever happiness strategies are most relevant to the client — a focus on gratitude and “giving back” are some of the others. “It’s just a matter of feeling that we owe our clients more than just dealing with the numbers. And it deepens the relationship when clients realize we really care about them,” she says. — Check out United Capital’s Duran: Wealth Management Is Dead. Long Live Life Management! on ThinkAdvisor.